Roth Fioretti LLC Law Firm > Uncategorised > Roth Fioretti, LLC does it again! Another jury verdict in client’s favor. Roth Fioretti’s team of Mark Roth, Ken Hurst and Tima Ramadani are proud to announce another successful federal court jury verdict! Plaintiff, D-Juan Owens, filed a lawsuit against The City of Harvey’s Police Department and Officers Steven Kelley and Joseph Ellison after suffering several injuries that he alleged were a result of excessive force. Owens sought recovery of $180,000 including $100,000 for past medical expenses, damages for his pain and suffering and damages for loss of a normal life. The defense denied that the officers were liable for any of the injuries that Mr. Owens suffered. After several hours of deliberation the jury rendered a defense verdict, finding that Owens was not entitled to any money. 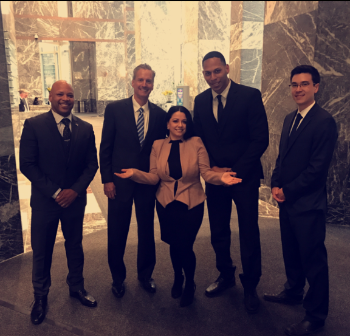 Shown below is the Roth Fioretti trial team of Mark Roth, Ken Hurst and Tima Ramadani along with officers Joseph Ellison and Steven Kelley.